Late last year, videocard manufacturers slowly began to separate their businesses from nVidia-only, or ATI-only videocard lines. At the time, nVidia wasn't producing the best products, and so the manufacturers who were only producing Geforce FX videocards were feeling the pinch in their market share. Yet, looking back the move makes sense. After all, would you expect a manufacturer to only produce AMD motherboards? Or, only Intel motherboards? No, I don't think so. 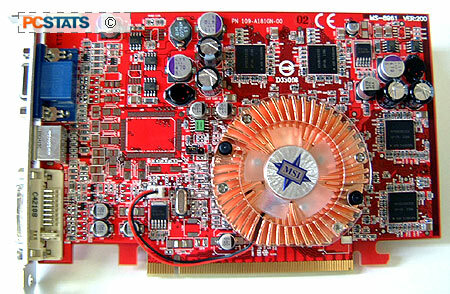 MSI Computer used to be entirely on the Nvidia side of the fence, but the company now produces videocards utilizing both sets of graphical chipsets. With the emergence of the PCI Express slot, the videocard sector has been churning out PCI Express videocards like there's no tomorrow... even if the demand is still somewhat lethargic. The increased cost of upgrading to a socket 775 Intel Pentium 4 platform is largely to blame for this, but with expectations that AMD will adopt PCI Express in the future, the last days of AGP 8X do seem do seem to be here. In this review, MSI Computer have given us the opportunity to test out one of their latest PCI Express videocards, the ATI Radeon X600 based MSI RX600XT-TD128 videocard. Along with the X600 core comes 128MB of DDR memory, a pair of video outputs (analog and digital) and even an S-Video output. 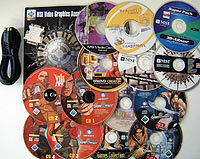 The necessary cables are included, along with a surprisingly large amount of bundled software (14 CD-ROMs in total). Both MSI and ATi consistently use red PCB's for their videocards as a matter of branding, so it's no surprise RX600XT-TD128 is red. If you enjoy playing your video games on an adjacent TV, you'll appreciate the fact that the RX600XT-TD128 videocard suports a S-Video output and comes with a SVideo-to-SVideo cable that is two meters in length! In general, videocard software packages have increased in value, but I'm still quite surprised at just how much software MSI is bundling with the RX600XT-TD128 videocard! Along with the default ensemble of DVD playback applications comes; XIII, URU and Prince Of Persia: The Sands of Time. With respect to the cooling solution on the RX600XT-TD128 videocard, things are kept simple. The little ATI X600XT core is cooled with MSI's "Starforce heatsink fan." The little cooler runs pretty quiet too.